compliance issues with AI-powered audit technology. Easier. More Efficient. Better Compliance. Fraud happens. Wasteful spending happens even more. But it doesn’t have to happen to you. 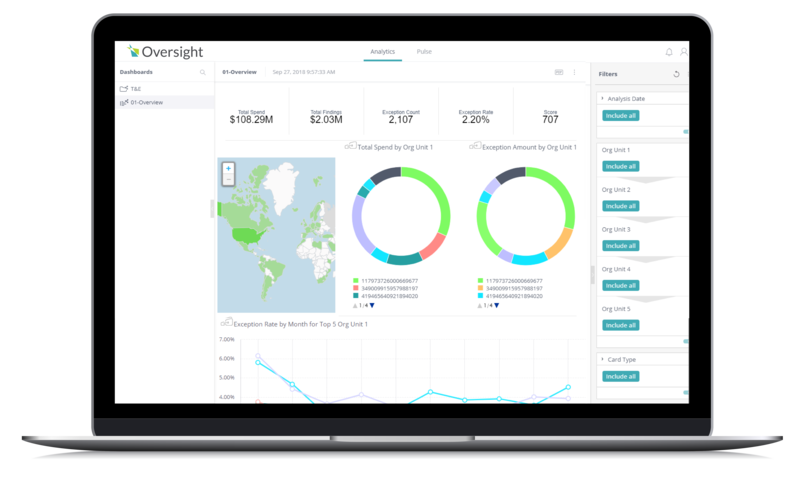 Oversight’s artificial intelligence platform automatically analyzes 100% of your expenses across ALL expense reports, purchase card transactions and accounts payable data to identify fraud, non-compliant purchases, and wasteful spending. Find the root cause of behavior that needs to be corrected, so you can educate employees and vendors, and avoid compliance risk. Oversight makes it easy to prevent non-compliant spending with right-time analysis. "You are essentially flying blind if you do not have a tool like Oversight, because Oversight can analyze data in a way that the human eye cannot. I'd rather have Oversight than an army of people trying to do the analysis."